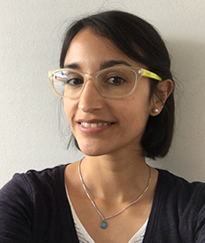 After obtaining her Biochemist title and a Masters degree at Universidad de Chile in Santiago (2009), Cecilia Silva-Valenzuela enrolled into the Biomedical Sciences PhD program at the same university, graduating in 2014. For her PhD degree she traveled for long-term stay at Univerity California, Irvine where she worked on the mechanisms involved in the preferential colonization and localization of Salmonella Typhimurium within murine mammary tumor tissue. Then, in 2015 she got a postdoctoral position at Tufts University in Boston, MA, USA where she worked in the ecology of Vibrio cholerae and its lytic viruses (bacteriophages). In 2016, she was named PEW Latin American Fellow in the Biomedical Sciences to continue her postdoctoral training until 2018. Her current work focuses on the use of genetic tools to characterize biological processes in microbes as well as in the development or improvement of bacterial therapies. 1. Cecilia A. Silva-Valenzuela, Andrew Camilli. Niche Adaptation Limits Bacteriophage Predation of Vibrio cholerae in a Nutrient Poor Aquatic Environment. Proc Natl Acad Sci U S A. 2019 Jan 11. pii: 201810138. doi: 10.1073/pnas.1810138116. 2. Tamara Reyes-Robles, Rebecca S. Dillard, Lynne S. Cairns, Cecilia A. Silva-Valenzuela, Max Housman, Afsar Ali, Elizabeth R. Wright, Andrew Camilli. Vibrio cholerae outer membrane vesicles inhibit bacteriophage infection. J Bacteriol. 2018 pii: JB.00792-17. (Highlighted in Nature Reviews Microbiology, published online 11 May 2018). 3. Molina-Quiroz RC, Silva-Valenzuela C, Brewster J, Castro-Nallar E, Levy S, Camilli A. Cyclic AMP Regulates Bacterial Persistence through Repression of the Oxidative Stress Response and SOS-Dependent DNA Repair in Uropathogenic Escherichia coli. mBio. 2018. 9(1):e02144-17. (Highlighted in Nature Reviews Microbiology 16, 122–123 (2018)). 4. Silva-Valenzuela CA, Lazinski DW, Kahne SC, Nguyen Y, Molina-Quiroz RC and Camilli A. Growth arrest and a persister state enable resistance to osmotic shock and facilitate dissemination of Vibrio cholerae. ISMEJ. 2017. 11(12). doi: 10.1038/ismej.2017.121. (Highlighted in Nature Reviews Microbiology 15(9):515-515 (2017)). 5. Espinoza RA, Silva-Valenzuela CA, Amaya FA, Urrutia ÍM, Contreras I, Santiviago CA. Differential roles for pathogenicity islands SPI-13 and SPI-8 in the interaction of Salmonella Enteritidis and Salmonella Typhi with murine and human macrophages. Biol Res. 2017 Feb 15;50(1):5. 6. Silva-Valenzuela CA, Velásquez F, Peñailillo J, Garcias-Papayani H, Fernández P, Tobar P, Contreras I, Santiviago CA, Álvarez SA. O-antigen chain-length distribution in Salmonella enterica serovar Enteritidis is regulated by oxygen availability. Biochem Biophys Res Commun. 2016 Sep 2;477(4):563-7. 7. Silva-Valenzuela CA, Desai PT, Molina-Quiroz RC, Pezoa D, Zhang Y, Porwollik S, Zhao M, Hoffman RM, Contreras I, Santiviago CA, McClelland M. Solid tumors provide niche-specific conditions that lead to preferential growth of Salmonella. Oncotarget. 2016 Jun 7;7(23):35169-80. 8. Silva-Valenzuela CA, Molina- Quiroz RC, Desai P, Valenzuela C, Porwollik S, Zhao M, Hoffman RM, Andrews-Polymenis H, Contreras I, Santiviago CA, McClelland M. Analysis of two complementary single-gene deletion mutant libraries of Salmonella Typhimurium in intraperitoneal infection of BALB/c mice. Front Microbiol. 2016 Jan 5;6:1455. 9. Molina-Quiroz RC, Silva CA, Molina CF, Leiva LE, Reyes-Cerpa S, Contreras I, Santiviago CA. Exposure to sub-inhibitory concentrations of cefotaxime enhances the systemic colonization of Salmonella Typhimurium in BALB/c mice. Open Biol. 2015 Oct;5(10). pii: 150070. 10. Porwollik SP, Santiviago CA, Cheng P, Long F, Desai P, Fredlund J, Srikumar S, Silva CA, Chu, W, Chen X, Canals R, Reynolds MM, Bogomolnaya L, Shields C, Cui P, Guo J, Zheng Y, Endicott-Yazdani T, Yang H, Maple A, Ragoza Y, Blondel CJ, Valenzuela C, Andrews-Polymenis HL, McClelland M. Defined single-gene and multi-gene deletion mutant collections in Salmonella enterica sv Typhimurium. PLoS One. 2014 Jul 9;9(7):e99820. 11. Pezoa D, Blondel CJ, Silva CA, Yang HJ, Andrews-Polymenis H, Santiviago CA, Contreras I. Only one of the two type VI secretion systems encoded in the Salmonella enterica serotype Dublin genome is involved in colonization of the avian and murine hosts. Vet Res. 2014 Jan 9;45:2.